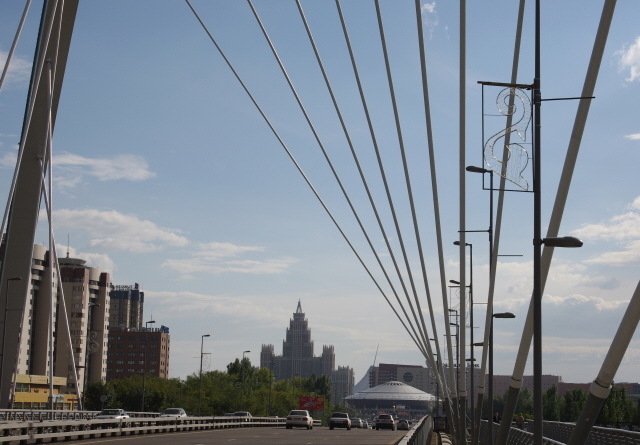 The shiny, glitzy new capital city of independent Kazakhstan. In addition to extravagant modern architecture to keep those with a taste for such things goggling in amazement, those with a penchant for witnessing cults of personality are well catered for here too. More background info: known as Akmola for most of its earlier history, the Tsarist period and still through the first few decades of Soviet rule, the place used to be a lot more modest than what it is today. It had a certain importance as a trading post and was strategically located on the Ishim river and later on a main train line. And agricultural programmes as well as deportations swelled the population to city size, but even into the mid-1990s it was only a fraction of that of the old capital Almaty. During the Virgin Lands Campaign (when the USSR launched a massive programme of turning large swaths of Kazakh steppe into farmland), the city was renamed Tselinograd accordingly ('Virgin Lands City'). 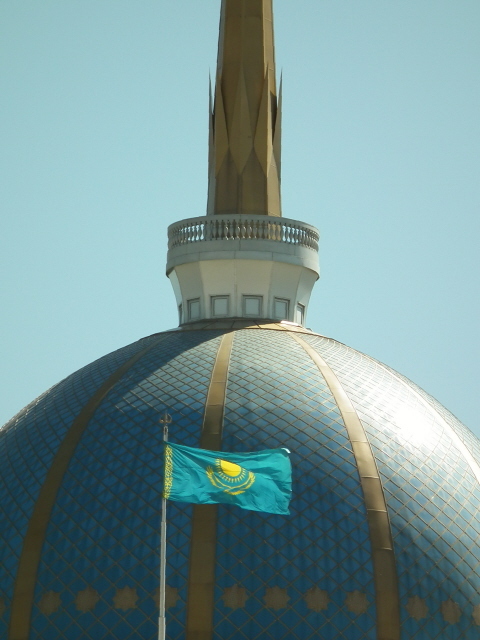 After Kazakhstan gained its independence in 1992 the old name Akmola was adopted again, but only for a few more years. In 1997 it was declared the new capital of the nation and the name changed again to the present designation. In Kazakh, "Astana" means simply 'capital city'. All of the government quarter has been built brand new since 1997 and sports some spectacular examples of modern architecture. 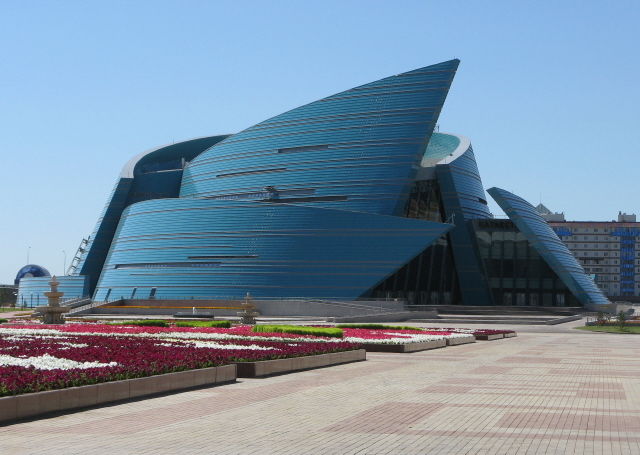 Why was Astana made the new capital? Nobody seems to know for sure, but several factors have been suggested, including its central location away from potentially volatile borders, especially in the south and east. Another advantage over Almaty may be that it sits in the open steppe with no limitations on expansion, whereas Almaty is hemmed in by mountain ranges. Astana also doesn't share Almaty's proneness to earthquakes. Furthermore, it provided an open playing field for excessively grand representational new architecture (for which Almaty wouldn't have had the space – at least not without the demolition of older quarters). The grandeur of Astana's new government district in particular is indeed on a massive scale. It all looks somewhat artificial, of course, but that even adds to the bizarre appeal. The "old town", in contrast, is comparatively humdrum and no match for the still far more cosmopolitan Almaty. Much of Astana remains a building site – as expansion continues and new ambitious architectural extravagancies are under construction. So the face of the city is bound to keep on changing. The core of the new government district is more or less finished, though. To the east of the Baiterek Tower two conical towers (housing government offices) stand out thanks to their golden mirrored facade. These flank the open plaza in front of the new presidential palace, which is called the Ak Orda. This is out of bounds to tourists but you can admire it from the outside – note the huge blue dome echoing Kazakhstan's national flag. To the south of the Ak Orda stands one of the city's newest and most flamboyant public buildings: a concert hall complex wrapped in a curved and tilted blue facade that defies appropriate description. To the north are the parliament and supreme court, both of which are much less mind-boggling to look at in comparison. The park in between the Ak Orda and Baiterek Tower is, likewise, flanked by architecturally less appealing edifices. In this case they're blocks of flats – super-exclusive and expensive flats for the privileged, for sure, but still only apartment blocks. West of the Baiterek Tower the landscaped axis leads all the way to the KazMunaiGas building, which is also sometimes called the "Gate of Astana", obviously enough thanks to its shape. Along the north of the axis lots of construction work was still ongoing when I visited in August 2011, but you already get an impression of weirdly curved skyscrapers. On the southern side an ensemble of the already finished Emerald Towers also sport unconventionally weird and wobbly facades, while the shopping centres beyond are less outrageous in their architecture. Similarly, the grand Nur Astana mosque isn't all that spectacular, though quite pleasant to the eye, what with all those golden domes atop whitewashed concrete domes and minarets. Beyond all this, more high-rises are rising from the level ground one after the other – too many to comment on – and yet more are to go up in the future. 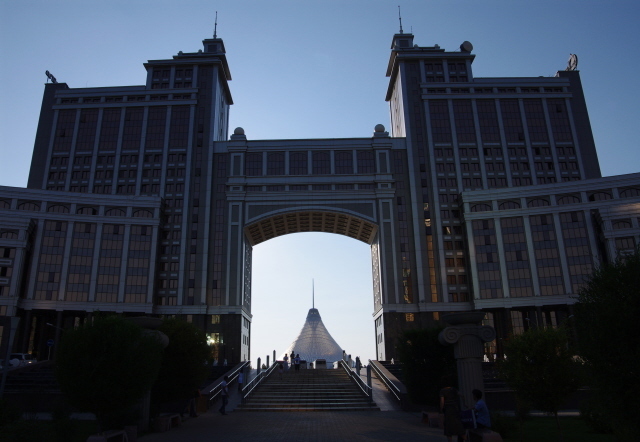 However, through the arch of the KazMunaiGas building and currently forming the western end of the main axis of the district is Astana's latest grand-scale landmark, the Khan Shatyr Centre. It's a giant tent centred on a huge steel spike. Cool as it is to look at, the function of the place is simply that of a shopping and entertainment centre – all global-branded and streamlined, of course, a playground for the affluent Kazakhs hankering after yet more westernization. Crazily, the amusements include a monorail that goes round the edge of the top floor, and a "beach club". On the eastern, right bank of the Ishim, the development of the new Astana has continued, and here the new star of the show is the spectacular pyramid of the so-called Palace of Peace and Harmony (in some renditions of the name in English 'harmony' is replaced by 'accord', 'concord' or 'reconciliation' – take your pick). Touring the inside is possible only on guided tours, which are also offered in English– and it's well worth doing. (Tours usually start at least hourly on the hour, daily between 10 a.m. and 6 p.m., and are included in the admission price of 500KZT.) The lower spaces are panelled in black marble – allegedly symbolic of Kazakhstan's dark past as part of the Soviet Union. In contrast, the upper floors, from the enormously spacious atrium to the very top, are all white and light – culminating in the "Cradle" right at the apex of the pyramid. The symbolism here is quite in your face: the golden/yellow top is taken directly from the national flag while the 130 white doves set into the blue stained-glass windows below allegedly represent the 130 different nationalities living peacefully together in Kazakhstan. 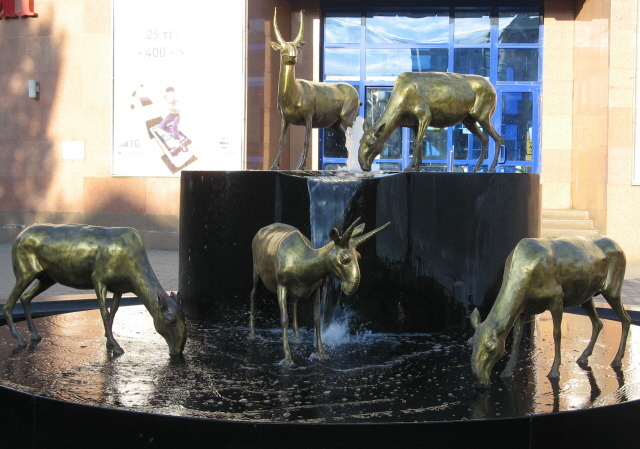 The birds are quite oversized, and the author of the Bradt guide to Kazakhstan perceived them as "slightly sinister" (also alluding to Hitchcock's "The Birds"). Through their wings you can make out the skyline of the new Astana. Inside the space is dominated by a white ring-shaped conference table – supposedly serving for the Congress of World and Traditional Religions. I hope they gather outside the summer months, though – it got extremely hot up here on the early August day when I visited, with the massive air-con system clearly unable to cool down this greenhouse-like top of the pyramid. Outside the pyramid to the east and across a massively wide boulevard stands a tall monument in the form a column crowned by golden eagle. More interestingly, however, there's a big bronze relief at the bottom that shows Nazarbayev at the centre, with a flock of followers devoutly gathered behind him. Currently at the eastern end of all the new developments a Convention Centre completes the string of modernity that is the new Astana. A massive new mosque was under construction just to the north when I visited, already dominating the whole area almost as much as the pyramid. Allegedly, this pyramid is supposed to be very centre point of Astana one day … which would suggest that twice as much of it will still have to be built in the years to come, given the fact that at present it's right on the edge of the city! We'll see … maybe. North of the new government quarter, along the southern edge of the City Park, a couple more sights may be worth taking in as well. Inside the Duman Entertainment Centre, decorated inside, amongst other things, with a somewhat scaled-down replica of a Soyuz rocket (cf. 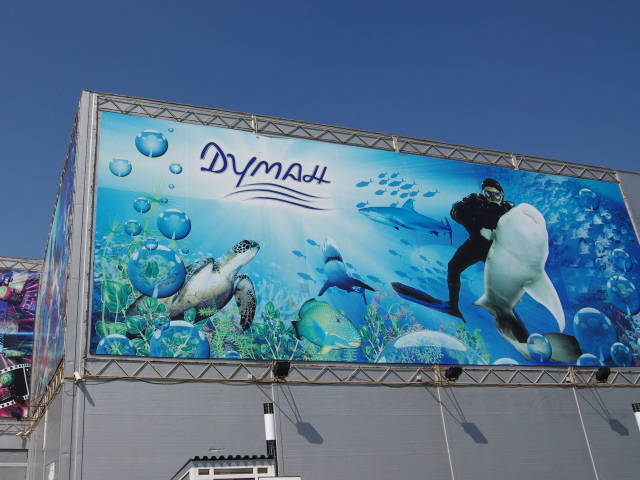 Baikonur), there is also an oceanarium – complete with a number of large sharks. And that thousands of miles from the nearest ocean! 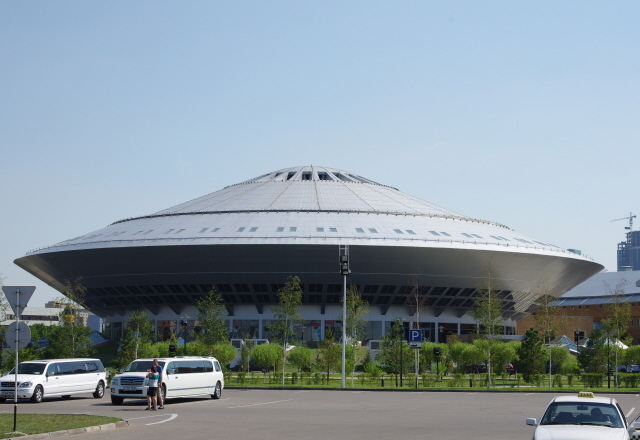 Opposite the centre, the enormous UFO-like disc that houses the circus looks quite out of this world too. Just inside the City Park, near the gigantic flagpole with its oversized Kazakh flag struggling to unfold, is the weirdly entertaining Atameken – a kind-of Kazakhstan-in-miniature park, where you can walk through a "map" of the country in between models of various more or less significant landmarks that are dotted across what in reality is a land mass that would take days to traverse. Some sights picked out are obvious enough, but a few others are less so, including a model of the GRES-2 power station near Ekibastuz! The Monument to the Victims of Political Repression that was supposed to be located nearby has apparently been moved, so I was told (namely to ALZHIR – though it wasn't made clear there which bits of the complex were the ones in question). The "old" city centre across the river, i.e. north and east of the curve in the river Ishim, does not hold anything of interest to those interested in the dark and weird, other than those two museums noted above, which have their own separate entries here. Location: Near the centre of the vast country that is Kazakhstan, although a bit further north and east than exactly bang in the middle. Access and costs: far out in the wide east of Central Asia, but relatively easy to get to; quite expensive though. Details: getting to Astana is easy, as you would expect of a capital city, even if it's only acquired that title relatively recently. The city has Kazakhstan's second-busiest international airport (after that of the bigger and more business-heavy old capital Almaty). Several airlines serve Astana; apart from the national carrier named after the city (Air Astana), Lufthansa, Turkish, Austrian, Ukrainian Airways and several Russian airlines fly to Astana. Air fares to Astana can be quite expensive, though, but shopping around and planning well ahead can make for significant savings (see also under Kazakhstan in general). Overland access is easiest by train, in particular when coming from the south on the main line from Almaty via Karaganda. This line also sports the country's only high-speed train, the Tulpar, which carts many government commuters back and forth between the old and new capital. It's much more pricey than normal trains though, with tickets for a two-berth sleeper compartment costing almost as much as internal flight tickets. Much cheaper ordinary trains are also available, though, for those who aren't in a hurry. With regard to getting around within the city note that distances are often significant, especially to, from, and within the new government district. Doing it on foot can be tiring if you're not used to such long walks (including along busy, noisy roads and building sites). It's time-consuming in any case. Taxis can help cutting distances and times and they're generally not too expensive (though rip-offs do occur), even if fares are higher than in the rest of the country. Astana has no metro, just buses – but I didn't use any. My guidebook didn't even spare a single line on them, so decided to rely on my own two feet and the odd taxi ride. Accommodation in Astana can be very expensive, excessively dear in fact. But a few mid-range options aren't too bad as long as you can cope with older Soviet-style hotels and their, well, quirkiness. Real budget deals are almost non-existent and those that are can be on the rough side. Astana isn't really a backpackers' destination anyway. And it also shows in the general costs of living, which are pretty high as well. Prices for eating out in proper restaurants can reflect the wealthy excess of the new rich elite as much as the rates for the upmarket hotels. You can cut costs by eating in simple canteens and local fast-food joints – or by self-catering. Only very rarely do I mention specific eateries, but I have to make an exception here. The Georgian restaurant "Tiflis" (as in the older name of the capital of Georgia, Tblisi) at 14 Imanov Street is a real gem, so good that I went back twice during my short four-day stay in Astana! The range of dishes (esp. the khachapuris) and the overall quality of the food is superb, with the widest choice for non-meat-eaters I've seen anywhere in Kazakhstan (while the usual shashlik-devourers are equally well catered for too). The atmosphere is good, also thanks to the nice courtyard setting (there's indoors seating as well, if the weather doesn't play along), the service is reasonably attentive and efficient and they even have English-language menus for those who need them. The "live" music (when I was there it was a singer crooning standard tunes to the accompaniment pre-programmed into and played from a laptop) may be less intrusive than in other places, but annoyingly there's an extra cover charge for this some nights. Still, the culinary delights to be had here (and decent Georgian wine) more than make up for such minor detractions. Highly recommended! Time required: a minimum of two days. One will have to be set aside for the new government quarter and all its modern architecture alone, and another to take in the rest of the city. You probably have to add yet another day if you also want to make the excursion to ALZHIR. Combinations with other dark destinations: one of Kazakhstan's grimmest dark sites is easily reached from Astana on a half-day excursion: the former ALZHIR prison camp, ca. 20 miles (35 km) south-west of the city. Further away to the east is the coal-mining area of Ekibastuz, which will appeal to those (like me) who are into the sight of pseudo-post-apocalyptic industrial wastelands. Easier to reach, by various train connections, is the city of Karaganda, south of Astana. The name is infamous mainly for the nearby former gulags of the KarLag system. Combinations with non-dark destinations: Astana itself isn't such a dark place to begin with (more quirky and weird anyway), and the modern architecture will appeal to many non-dark tourists who are into city breaks. Real sights in the "old" part of the city are sparse: for starters, there isn't really much that is genuinely old, except for a few churches or so, and these are not all that spectacular either. 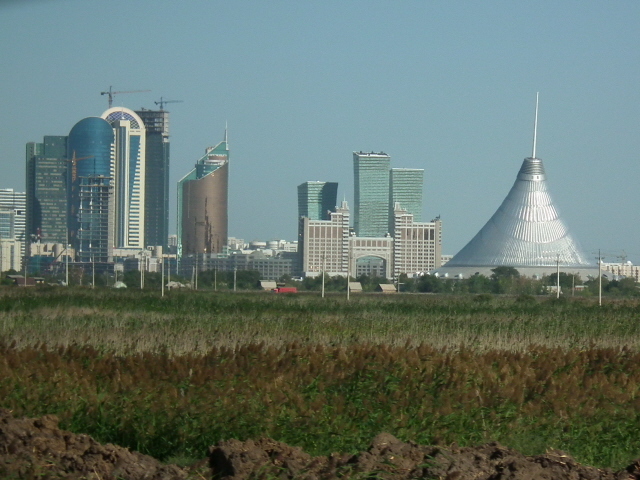 Other than that, there are a number of monuments and more modern architecture – but again, none of this can match the exuberant excesses of the new Astana on the left bank to the south of the centre (see above). Outside Astana, the hills, forests and lakes of Borovoye National Park north of Astana are a nature lover's delight – mainly for the Kazakhs themselves, but the area is also marketed with foreign tourists in mind and frequently dubbed "Kazakhstan's Switzerland" (which is a bit of an exaggeration, as it isn't exactly an Alpine mountain range).